The ground boasts a capacity of 32,000 (all seated), the design features some innovative features such as perspex roofing that runs around much of the ground that allows more natural light to enter the stadium which helps the pitch to grow. 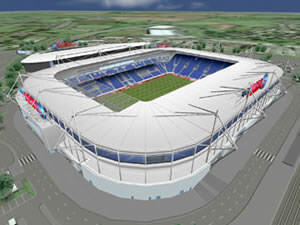 For those trivia fans amongst you the ground was built by the same people that built the millenium stadium! As far as your view of the action goes, you'll find yourself seperated some distance from the pitch. Overall you'll have a decent enough view - but you might struggle a bit when the play is at the other end of the pitch. There was a great atmosphere at the game we attended - with plenty of noise from both sets of fans. Our reviewer found the leg space to be adequate - although a bit of a squeeze - but he does admit to being 6' 2" so those of us of more average proportions should be fine! There are a number of match day services on offer - you can find out the details with up to date timetables on the official ricoh arena website. The stadium itself is easy enough to find, you leave the M6 at Junction3 and then take the A444 towards the city centre. You'll find the stadium on the left after about a mile. The train station is a good 3 and a half miles from the ground, which is for the most of us too far to walk. Your best bet is too jump onto one of the shuttle buses that operate from the bus station (directly outside the station) to the stadium. There is a fairly large retail park near the ground - but the usual match day parking restrcitions apply. There are a number of car parks within walking distance of the club so parking really shouldn't be a problem. If you are a registered user then you can login, and create your own personal review of Coventry City Football Club - Ricoh Arena. These reviews can be private or public.